The bank was open late for Derrick Rose last night. The Bulls took a two games to one lead over the Cavaliers, thanks to his buzzer beating three pointer. "I don't mean to sound cocky", Rose said, "but that's a shot you want to take if you are a player in my position". Clutch shooting isn't easy, and it gets progressively harder as the stakes increase. For Rose's bank shot last night, roughly 50% of the game's win probability hung in the balance (make: win, miss: overtime). Last night's shot fell (with a little help from the United Center glass), but how has Rose fared in similar clutch situations, and how does that compare to league averages? 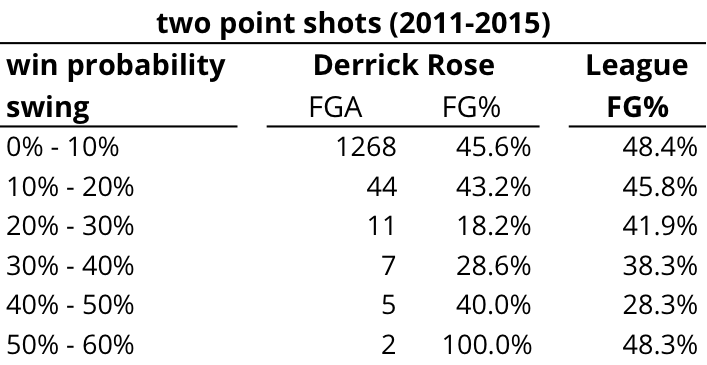 The table below summarizes Derrick Rose's three point field goal percentage as a function of win probability "swing" (i.e. the stakes). Results are somewhat mixed. 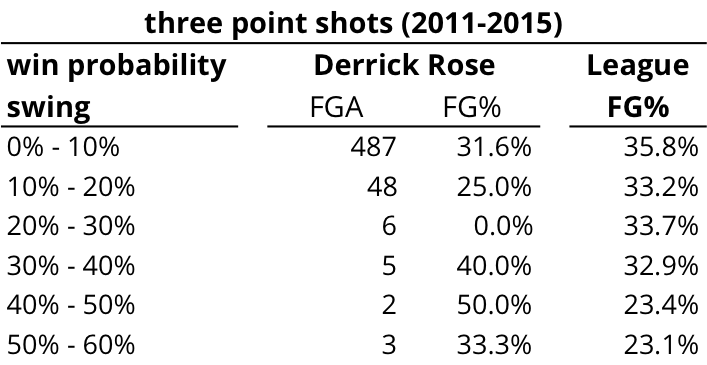 For one, Rose has never been a high efficiency shooter, and it shows in these tables. 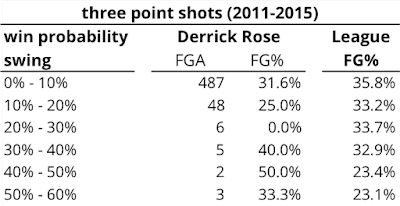 In the 10% to 30% range, Rose is actually a below average clutch shooter. These situations usually take place in the latter half of the fourth quarter with the score close. Not buzzer beater territory, but definitely "crunch time". As the stakes increase, however, his performance improves. With at least 40% win probability at stake, Derrick Rose has hit 40% of his three pointers, compared to a league average of 23%. And he has hit 57% of his two pointers in that range, compared to a league average of 30%. 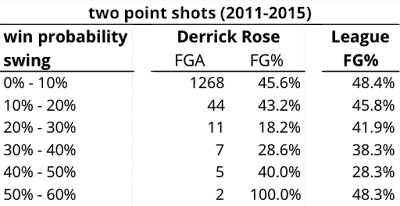 Of course, we're dealing with very small sample sizes at this point, with only 12 shots taken in this 40%+ range. In many ways, Derrick Rose's performance last night was a microcosm of his clutch performance over the past four seasons. Prior to his game winner, Rose's win probability added (WPA) total was standing at -13%, having missed two key layups in the final minute that fell into that ~20% swing, "crunch time" phase of the game. It took a buzzer beater, and some luck, to swing Rose's WPA balance back into positive territory.